Asphalt sealer is a surface protectant used in sealcoating that acts as a coating for your asphalt that blocks out harmful ultraviolet rays, preventing moisture penetration, and helping to prevent oxidation. 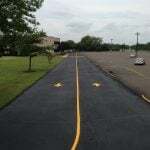 Sealcoating your commercial parking lot and/or your driveway every 2-3 years is not only used as a preventative measure, but also, as an aesthetic upgrade sure to extend the life and quality of your asphalt pavement. When applied in conjunction with our hot rubberized asphalt crack filler, your asphalt pavement’s natural deterioration rate drops dramatically. Is it important to repair asphalt cracks with hot rubberized asphalt sealer before sealcoating to prevent larger pavement flaws from occurring. Asphalt sealer adds a protective layer to your asphalt helping to protect against UV rays and spills. Sealcoating reduces the rate of water permeation to your asphalt and its base. This is very important, because water is the most damaging element to your asphalt. A parking lot or driveway that looks fresh overall improves the aesthetic appeal and value of your property. Overall, sealcoating every 2-3 years can help to preserve and extend the lifespan of your asphalt pavement. 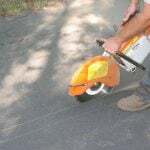 Cleanup and inspect your asphalt. Ensure the pavement is completely dry before sealer application. Remember that your lot will need to be restriped after sealcoating application. Typically, the best time of year for asphalt sealer is the summer for several reasons. However, this does not mean that sealcoating cannot be completed effectively through to October. In fact, crack filling, patching, and sealer should all be on your fall maintenance to-do list prior to winter! Using only the best materials, EastCoat Pavement’s advanced sealcoating process can add years to the life of your asphalt investment. Our liquid asphalt driveway sealer application process includes state-of-the-art asphalt sealer sprayer equipment, helping to ensure you receive the best look at the best price. 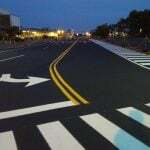 Specifically, when it comes to commercial asphalt sealer, sealcoating asphalt is beneficial because it dries fast and can be done in sections, or on weekends to minimize traffic interruptions to your business. 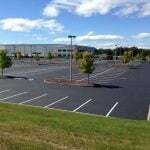 Asphalt pavement sealer can significantly increase your building’s curb appeal. The rich, dark color of asphalt sealer gives the blacktop a fresh and new look, improving its overall appearance. When applied correctly, asphalt based sealer will create a non-porous surface that will aid in the washing away of debris and dirt during rain helping to also ensure a consistently clean look. Additionally, a well-maintained lot will be safer in terms of traffic and in protecting your asphalt investment.